Tim Meyer from TPM Customs is at it again! 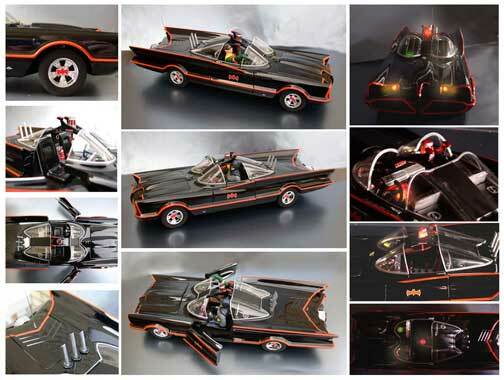 Here is his latest tricked out 1:18 Hot Wheels Batmobile (currently on eBay) sporting most of his previous upgrades and adding lights and a set of accurized antlers from our new parts upgrade set – this is one hot Batmobile! Tim handwired tiny model railroad lights inside the hood and is powering them with a regular 9V battery. 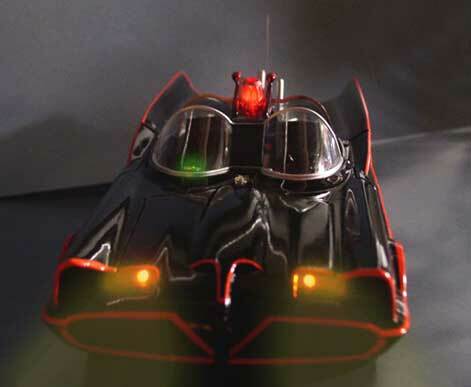 Lighted parts: Batphone, Detectoscope, 5 colored dash lights, bat-ray (front turn signals) and the beacon! Other new details – this car is sporting a set of our new accurately shaped resin antlers and take a look at the tiny barris “saturn” emblem on the front quarter-panels. This detail will be available freshly sized, in our decal and photo-etched sets. For those of you who aren’t modelers and have been asking about our build-up/upgrade services – now’s your chance – get to eBay! lovin’ she handed me the box. It is Saturday and I am 6 yrs old. Excellent Batmobile, looks great. I also have a 1:18 model as well. But l would like know where you got the Batman and Robin figures,how much do they cost as I would like to get a hold of some also if possible. Now if I can fine a kit of the Batboat I’ll custom it with the Batmobile to match my customized Corgi Batmobile and Batboat set. This car includes Batman & Robin figures? Yes this car sold with a set of figures in it back in July.